A fighter pilot in World War II, Richard Kirkland was no stranger to war, or to flying. But even he was confounded by helicopters when they first appeared. Nevertheless he tried one out and was intrigued by their design, flexibility, and ability to land anywhere. 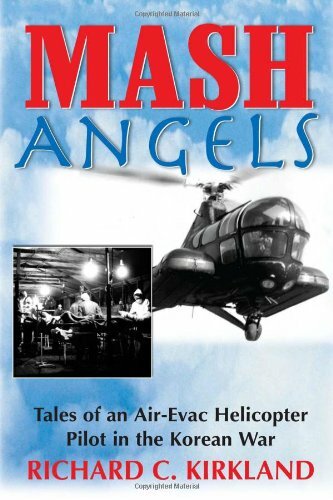 Still, he was a bit disappointed when he was assigned to be a helicopter in the Korean War but in this memoir he describes his transformation from helicopter skeptic to devoted pilot. His rotation included time at a MASH hospital (also new, and upon which the show MASH was based) where he rescued injured soldiers and brought them to the hospital. During another part of his rotation he flew missions to pick up pilots that had been shot down behind enemy lines. The memoir also includes plenty of stories about friendships, romances, and other aspects of military life during the war. I've been mildly obsessed with helicopters ever since I flew in one over the Grand Canyon, an experience that I was terrified of (I hate flying in airplanes) but turned out to be fantastic. About a month ago, I finally took an introductory helicopter flying lesson, and that has only fueled the fire. Since lessons are cost-prohibitive, I tried to find books about helicopter pilots and there are surprisingly few. This one apparently isn't well-known but it very much fit the bill. Now, the writing isn't going to win any prizes - he's primarily a pilot, not an author. The dialogue is quite folksy, with frequent use of "good ole" and "yer" but not bad enough to be a distraction. The stories were good enough to hold my interest and I found the book quite enjoyable. All I know about the Korean War I learned from watching episodes of MASH, and this....well, honestly, it was a little like watching MASH in parts (which is a good thing!) but also really quite exciting and suspenseful. Some of the helicopter rescues were very tense; it's a true story, after all, and they don't always end well during a war. I did a little googling to find out if Kirkland is still alive, which he is (and his artwork is definitely worth checking out). I found this news story about him and I recommend it if you're at all interested in war experiences. This book obviously isn't for everyone, but if you have a particular interest in Korean War experiences (or helicopters!) I think it's a great bet. I'm quite glad I found it.